I know I post several recipes for peanut butter, but it is a favorite of mine. Slow Cooker Peanut Butter-Chocolate Swirl Cheesecake will have you doing summer salts. Combine crumbs with brown sugar; mix in melted butter until well moistened. Pat into a 7-inch springform pan. In a medium-sized mixing bowl, with an electric hand-held mixer, cream together the cream cheese and 2/3 cup brown sugar. Add eggs and beat on medium speed for about 2 minutes. Add peanut butter, flour, and vanilla; beat about 2 more minutes. Pour all but about 1/2 cup of the batter into the prepared pan. Combine the melted chocolate chips with the remaining batter and pour on top of the batter in the pan. 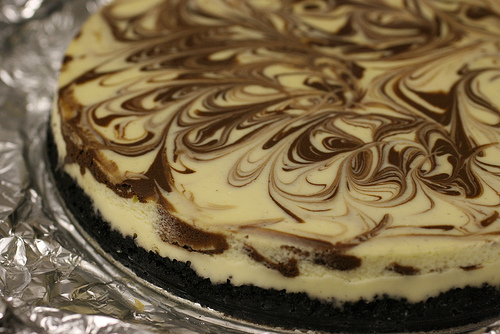 Cut the chocolate batter in gently with a knife to make a swirling pattern, without disturbing the crust. Place on a rack or aluminum foil ring (to keep the pan off the bottom of the pot) in the slow cooker. Cover. Cook on high for 2 1/2 hours. Turn heat off and leave for about 1 1/2 to 2 hours, until cooled enough to remove. Cool completely before removing from pan. Chill before serving, and store leftovers in the refrigerator. Looks super yummy! Unfortunately, I cannot fit a round pan in my oval crock pot. 🙁 do you know what the time/temp would be to bake in the oven?? Hello Melissa! I unfortunately have not attempted this in the oven, sorry your oval crock pot will not fit your pan! Happy Crocking! What size crockpot? An can anything be used in substitution for the sprig foam pan? Hello Christina, you will need the large crock pot to make this, and you can use another form of a pan, but most likely it will not come out the way you would like it, as it would be scooped out instead of being able to slice it! But if that doesn’t matter to you, then certainly you can use another type pan! Happy Crocking! Just stumbled across your site. I am super excited about trying this recipe. Thanks for sharing. Hi, just wondering if regular white sugar will be ok instead of brown? Hi Paige, How did your Cheesecake turn out?